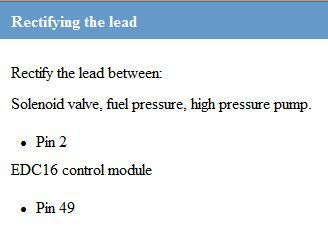 According to the WIS you should have more than 500Kohms between Pin2 and ground at the high pressure fuel pump. Yes you could tap a wire directly from 49 to 2 to eliminate but the fact you have a low resistance means it isnt broken.......... suspect there is a control resistor in the ECU somewhere that may be bad. Last edited by voodooirl; 03-15-2019 at 12:02 PM. Best route is probably to get the ECU cloned to another or hunt for a used ECU on Ebay of the same part number and pair to the car with Tech2. I know someone who can do the cloning although you would have to remove it and send it across to the UK. The ECU needs to be opened and relevant memory chips(immobiliser and map) probed then transferred to a donor using something like Kess. if you want details send a PM.